Early in the play, I. i & ii, Argan is counting his money and then rings for help. He is alone and he is gullible and vulnerable. When Toinette enters his room, she says to Argan that he is being milked, which explains why he needs a doctor as a relative. In the image placed above, Angélique and Cléante are singing in order to communicate their feelings. This is is not a play-within-a-play. It is a ploy, but Argan and the doctors are watching. Argan does not want a young man, including a singing teacher, to be alone with Angélique. Argan wants Angélique to marry a doctor. Idée fixe. Therefore, we could look at the third and final act as a form of anagnorisis, effected through a play-within-a-play and serving Argan’s needs first, and, second, the young couple’s needs. First, the doctors leave because they have been insulted. Argan is desperate, but in comes Toinette playing doctor. These scenes are theatrical, but Argan’s fancy will not go away. He is a hypochondriac, which is a real illness, so he needs a doctor (V. viii). By helping her master, Toinette also helps Angélique and Cléante. Toinette as doctor leaves and re-enters as Toinette. Second, Argan agrees to feign death twice, although it scares him. Argan recognizes his own blood in Angélique’s grief. Argan lifts obstacles to the marriage of the young lovers. Cléante may marry Angélique, if he agrees to become a doctor, which he does. Mais, mon frère, il me vient une pensée. Faites-vous médecin vous-même. La commodité sera encore plus grande, d’avoir en vous tout ce qu’il vous faut. However, Argan needs doctors, and Cléante says he is ready to do anything. En tout cas, je suis prêt à tout. The rest is an interlude during which Argan is turned into a doctor. So, all’s well that ends well. ensuring the young couple marries. But most importantly, it is suggested that we can find help within ourselves, or within our household. Toinette and Béralde do not mistreat Argan. He is a beloved father and although comedy leads to the marriage of young lovers, which means overcoming a father’s, the pater familias, resistance, the final society of the play includes the father. Everyone accepts Argan’s fancy. We all have petites lubies, whims. When I was a student, professors used the terms play-within-a-play and théâtre dans le théâtre interchangeably. The main example was Pierre Corneille‘s L’Illusion comique (1636), which was also considered a mise en abyme. Additionally we read Jean Rotrou‘s Le Véritable Saint-Genest (1647). In fact, Rotrou wrote a play entitled L’Hypochondriaque (1631), but it is not a forerunner of Le Malade imaginaire. However, Le Médecin malgré lui is rooted in a thirteenth-century fabliau entitled Le Vilain Mire (Wikisource FR). Mire meant médecin in medieval French. Le Médecin malgré lui will be discussed in my next post which will also include a few words on Le Médecin volant and L’Amour médecin. These are very short farces. I did not mention Élomire hypocondre ou les Médecins vengés (1670, according to Maurice Rat ). 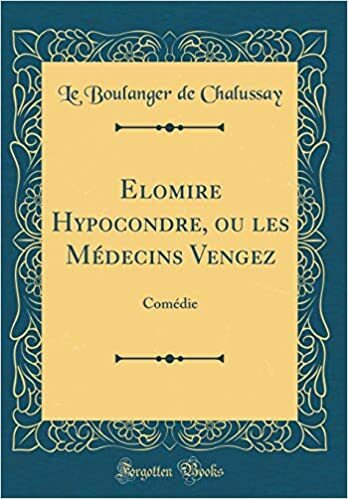 It is a comedy published by Le Boulanger de Chalussay. The text is available through Amazon and other booksellers. Élomire is an anagram of Molière. Molière was not a hypochondriac. He suffered from pulmonary tuberculosis. The comedy was never performed. Will G. Moore, Molière a New Criticism (Oxford: Oxford University Press, 1949), p. 72. Maurice Rat, ed., Les Œuvres complètes de Molière (Gallimard: Bibliothèque de la Pléiade, 1956). p. 998. I thank you most sincerely for helping me write my book.